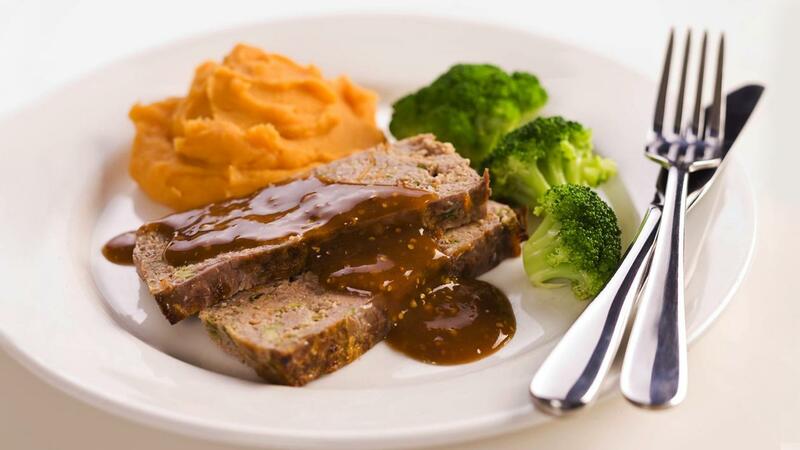 Meatloaf is a much loved meal for aged care residents. Gravy completes the dish and with the addition of mustard adds another flavour dimension. Preheat oven to 180 degrees Celsius. Spray 2 x 6 cm-deep, 11 x 21 cm (base measurement) loaf pans with oil spray to lightly grease. Line with baking paper. Place the grated zucchini in a colander. Use your hands to squeeze out any excess moisture. Place the zucchini, beef mince, carrots, onion, sausage meat, parsley and eggs in a large bowl. Season with the CONTINENTAL Beef Flavoured Booster. Press the mince mixture into the prepared pan. Bake in oven for 40-50 minutes or until the juices run clear when a skewer is inserted into the centre. Place a wire rack on a baking tray. Turn the meat loaf onto the wire rack. Set aside to drain any juices from the meat loaf. Place the 1 L of water into a large pot and whisk in the CONTINENTAL Professional Instant Rich Brown Gravy and bring to the boil stirring continuously. Reduce heat and simmer for a further 2 minutes. Stir in Colman's Seeded Mustard. Place the 2 L of water in a large pot and bring to the boil, remove from heat and whisk in the KNORR Instant Sweet Potato Mash Mix until well combined. Cover and place aside for use. Cut the meat loaf into thick slices. Serve with mashed potato, broccoli and mustard gravy.